Choose from the menu below and receive a 175ml bottle of beer with each course and a bottle to take away! Go to the bottom of the page to claim this offer! 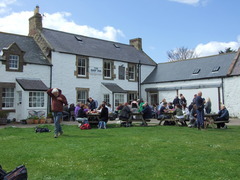 WINNER OF North Northumberland Pub of the Year 2013. At The Ship Inn we run a small, busy and efficient kitchen with all our food cooked freshly to order. We pride ourselves on cooking simple food extremely well. We use first class local ingredients and have a very small evening menu which changes daily. We serve interesting vegetarian food and delicious old fashioned puddings. Nearly all our fish is caught by local fishermen. From June until October we serve lobster straight from Newton Bay, arrive at the right time and you will see the 'Lobster man' en route to The Ship walking up the beach with a bucket of lobster in each hand. All meat comes from local farms and is free range wherever possible.